Evidently Recycle Bot is having trouble sourcing new gullible investors. Withdrawal problems from existing investors continue to pour in and, finding it a distraction from his enjoyment of invested funds, CEO Laurie Suarez has announced he’s had enough. withdrawals are being processed and from now I will be no longer accepting messages regarding them. As I understand it Recycle Bot’s “withdrawal process” requires new investment to be made before Recycle Bot can honor existing withdrawal requests. Following Recycle Bot’s initial collapse, that isn’t happening. 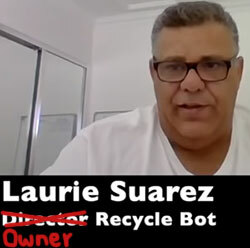 Suarez further advises that Recycle Bot victims who are unhappy about having lost money are “no longer going to be tolerated”. If you’re not happy with it, quite simply please let admin know and we will close your platform down. You can take your withdrawals and venture on. Naturally Recycle Bot victims who opt to leave will forfeit any outstanding funds invested. Recycle Bot initially hitched itself to The Berlin Group and advertised a 168% ROI every 60 days. ROI revenue was alleged to be sourced from activities related to recycling, however no evidence of any recycling activities ever materialized. Following Suarez coming out of the shadows and taking control of Recycle Bot as a fully fledged opportunity, initially there was some faff about a partnership with an oil and gas company – in Uganda of all places. Then there was nonsense about the purchasing of a large industrial plot in Geelong, a city in Victoria, Australia. That all seems to have now been tossed in favor of forex bot trading. In reality Suarez can attach his Telegram Ponzi bot to any ruse. All he needs is new investment to feed the bot. New money in, existing Recycle Bot investors get paid. No new money in and you get lots of angry investors. Sitting on who knows how much money that was invested in Recycle Bot since The Berlin Group to begin with, Suarez’s victims can hopefully appreciate why he simply doesn’t have time for them. This platform has a vision and plan and it will not be bullied by people to divert that process. I mean honestly, who are these people? STOP BULLYING PONZI SCAMMERS! Was that photo taken inside a restroom or something? The bots just collapse and another crops up. What you’ll find is it’s actually the same Telegram bot. All Suarez and friends do is attach a new cover story.